In the mapping interface, the adjacent menu allows the user to build a query step by step. 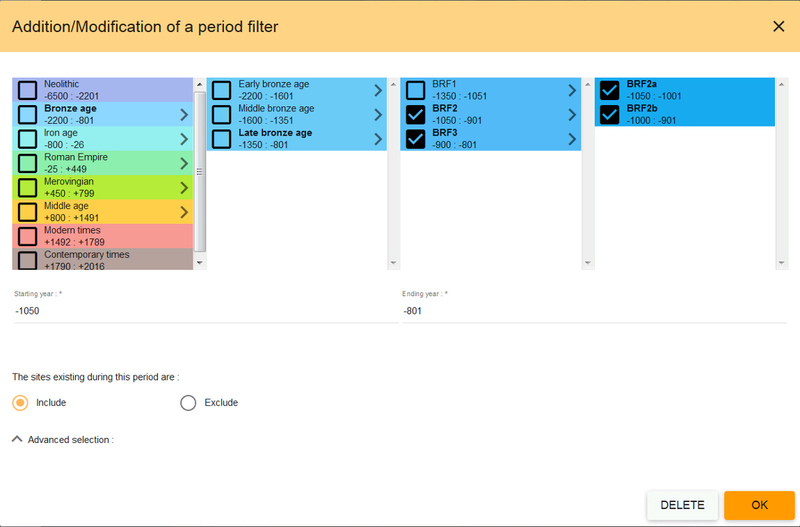 The choices displayed on the different filters are those selected by the user in his personal project. If needed, it is also possible to adjust the geographical and chronological frames, the databases to query, the specific characteristics of the site and some other options. This menu offers a real-time lecture of the ongoing query ; it depicts the selected elements in the specific windows. When they are chosen, the user can conceal (chevron) or modify (pencil) them before launching the query. Below are described the possible options for each entry of the menu. 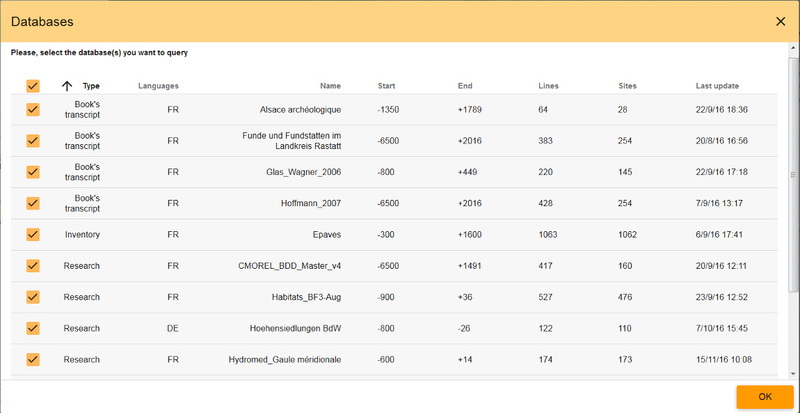 ArkeoGIS allows the user to save and name a relevant query. It can be found by its name thanks to the floppy disk icon. In the same menu, the user can delete a saved query thanks to the bin icon. 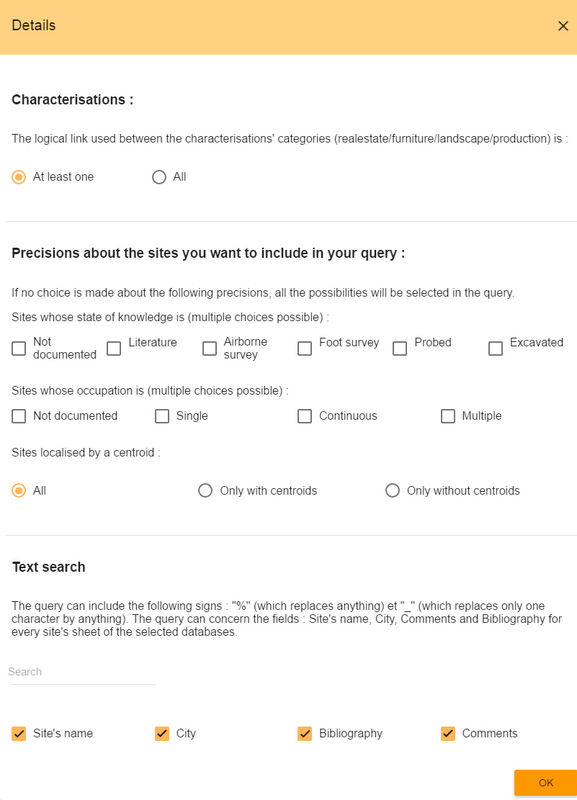 The launching of a saved query automatically chooses the relevant elements into every windows of the query menu (geographical frame, databases, chronology, characterisations and options). Each of these element can be modify to create a new query. The saved query’s name is displayed on the map legend. 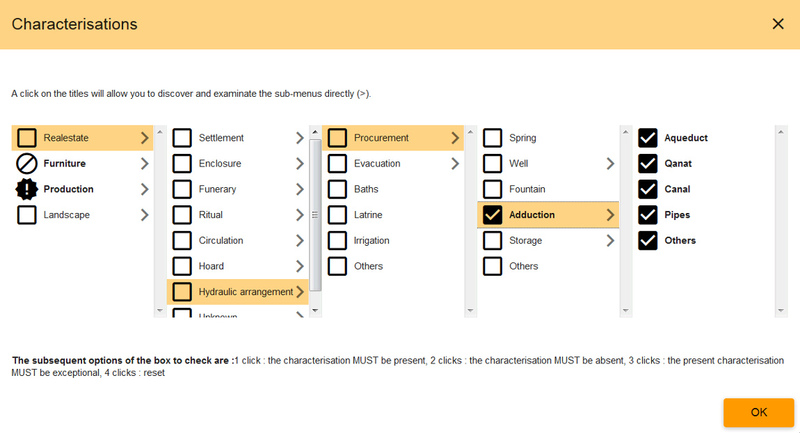 1) The choice Map is the default entry. The query concerns the whole area displayed on your browser. 2) When you click on Rectangle you are requested to "draw the selection area on the map". To do so, the user must "click, drag and drop" the cursor on the map to draw a rectangle. Its size can always be changed by clicking on the angles or moved by clicking on its center. 3) When you click on Disc you are requested to "draw the selection area on the map". To do so, the user must "click, drag and drop" the cursor on the map to draw a disc from its center to its border. The cursor broadcasts the lenght of the radius. Its size can always be changed by clicking on the radius or moved by clicking on the center. 4) When you click on Free you are requested to "draw the selection area on the map". To do so, the user must click successively on each summit of the area, ending by clicking again on the first one. The size of this area can always be modify. 5) When you click on the pencil icon Coordinates a new tool appears. The user must then enter the coordinates of a dot. These coordinates can be either decimal or in the degrees-minutes-seconds form. The user must also choose a radius size (in kilometer) around this dot. The user can always cancel or modify this selection. He also always must validate its selection before using it in the query. When the query is saved, so is the selection area. When the user chooses to display a saved query, this area will be placed on the center of your screen. It will also be possible to modify the area at this point. ArkeoGIS allows the user to access different databases in a single interface. The available databases on the menu have been selected in the personal project of the user. The user can choose to query as many databases as needed. - The Book's transcript databases (that come from the work of a researcher who transcripted a book into a database). Type (Inventory, Research of Book transcript), Language (EN, ES, FR, DE), name, starting date, ending date, total of lines, total of sites, date and time (GMT +1) of the last edit. The table can be sorted out according to each of these categories. The displayed periods are those from the chronology chosen by the user in its personal project. 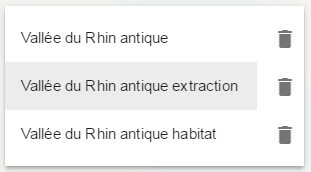 The user can find the name and the chronological frame of each period in the selection interface. The background color in the menu will be repeated for the sites of this period on the map. The color shades are used for each accuracy level. The paler being the less accurate and the darker the most accurate. ArkeoGIS allows to choose consecutive periods as queried periods. The user can also select an under period, regardless its parent period(s). The unselected parent periods' name is in bold to allow the user to find it easily. During the selection of one or more consecutive periods, the starting and ending dates are automatically updated in the specific numeric fields. 2) Choice by calendar year. The user can modify the fields "starting year" and "ending year" filled by its choice or choose a specific starting and ending year for its specific queried period. Example : The illustration below displays the period choice : BRA2 and BRA3, the calendar years "starting year" and "ending year" are then : the start of BRA2 (-1800) and the end of BRA3 (-1601) from this chronology. 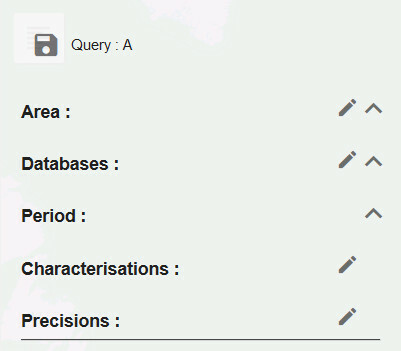 In the same query, the user can include several periods with different options. These choices can be modify at anytime. The sites existing during this period are to be : included (which is the default choice as displayed on the image below) or excluded. And this : Only Potentially (unknown) or, Potentially or Certainly (include the unknown) (default choice), or Certainly (exclude the unknown). The characterisations presented in the menu are those chosen by the user in his personal project. Example : the illustration below depicts the choice of every water adduction. Example : the illustration below depicts the choice : I don't want the sites with furniture. Example : the illustration below depicts the choice of the exceptional production's sites. - Fourth click on the square allows the user to reset. Example : the illustration below depicts this choice for the landscape. In this section are presented the options that allow the user to refine his query. The logical link used between the characterisations' categories (real-estate/furniture/landscape/production) is : At least one (default choice = OR) or All (=AND). - The sites located by a centroid (single choice) : Don't filter (default choice) or Only if located with a centroid or Only if located without a centroid.